PON is the abbreviation of passive optical network, which only uses fiber and passive components like splitters and combiners. EPON （Ethernet PON) and GPON (Gigabit PON) are the most important versions of passive optical networks, widely used for Internet access, voice over Internet protocol (VoIP), and digital TV delivery in metropolitan areas. Today we are going to talk about the differences between them. Nowadays, since many experts have different opinions on GPON and EPON. Thus, there is no absolute answer to determine which is better. But one thing is clear: PON, which possesses the low cost of passive components, has made great strides driven by the growing demand for faster Internet service and more video. Also, fiber deployments will continue expanding at the expense of copper, as consumer demands for “triple-play” (video, voice and data) grow. This entry was posted in PON Systems and tagged EPON, GPON on December 8, 2015 by Admin. 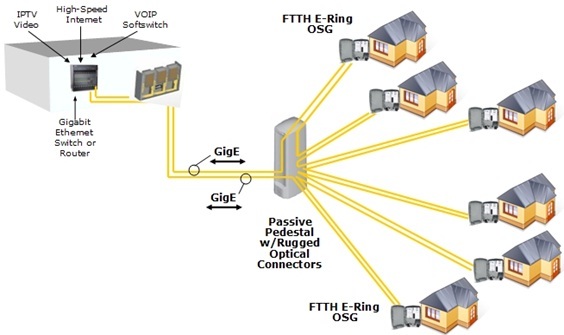 FTTH, which is short for fiber to the home, is an ideal fiber optic architecture as the fiber optic service to home. It can transport large amount of data from caller to caller fast and reliable. In the light of present situation, there are more than 10 million homes all over the world adopted FTTH network in that it holds many advantages over current technologies. Here let us figure them out. Some experts has pointed that fiber-to-the-home connections are the only technology with enough bandwidth to handle projected consumer demands during the next decade reliably and cost effectively. Of course, we all know that FTTH is a passive network that do not need active components. This feature makes it dramatically minimize the network maintenance cost and requirements. What is more, it features local battery backup and low-power consumption, which indeed bring much convenience to people’s lives. But, are that all its advantages? I am afraid that these simple advantages can’t convince people that FTTH can bring the life-enhancing benefits to their lives. And so do you. So, what are its remarkable benefits? Please take a look at the blow words. The first thing you should know that it is less susceptible to corrosion or power surges from lightning and other sources, resulting in greater reliability. Because of its higher stability and less interruptions, it replaces copper infrastructure with new technology, allowing for future evolution of technology. Second, it can provide virtually unlimited bandwidth capacity. As we mentioned above, it can support large amounts of data and keep up with consumer and technology demands, which makes it access to more advanced communication products like streaming video, internet TV, quality video conferencing, “smart home” technology, IP video home monitoring, gaming and so on. Third, it brings profits to your home and the community. According to the Fiber-to-the-Home Council, we have got a amazing data that FTTH has increased the home value as much as $5,000. With the advanced technology, it made the “global village” come true. Even at ultra-rural areas, people still can compete on a global scale in their work or business. Now that we have learned the benefits of FTTH, I guess some people may intend to deploy FTTH network. Fiber deployment is a trade-off driven by the cost of the service relative to the potential revenue per subscriber. So before you deploy it, please read the below tips which can help you avoid loss. Deploy the fibers in the high economic density of the service area. The number of houses and enterprises that a fiber passes by will be translated into the number of money. So , if you deploy your network in a high economic density place, you will get your investment back and make high profits soon. Deploy your network in the place where has existed current fiber/copper wiring. It is easiest to serve a given area by following the current conduits and loops and staying with the rough topology of the old installation. This method will save you a lot of money compared with restarting wiring for your network. So if you can’t run the fiber directly to the home, just take it is to the node where the loops currently collect. Recently, FTTH has been adopted by thousands of families, and the continuous prosperity will last for a long time. If you want to deploy a FTTH network, you can come to Fiberstore to get the needful tools. In Fibersotre, you can find the most cost-effective FTTH solutions including FTTH fiber cables, fiber optic splitters and some others. They are all tested in good condition with reasonable prices. So, if you choose Fiberstore, you just choose your better FTTH network with low cost. This entry was posted in PON Systems and tagged FTTH network, FTTH solutions on November 24, 2015 by Admin. Nowadays, there is a growing popularity of Video-on-Demand (VoD), VoIP and increased IPTV deployment. 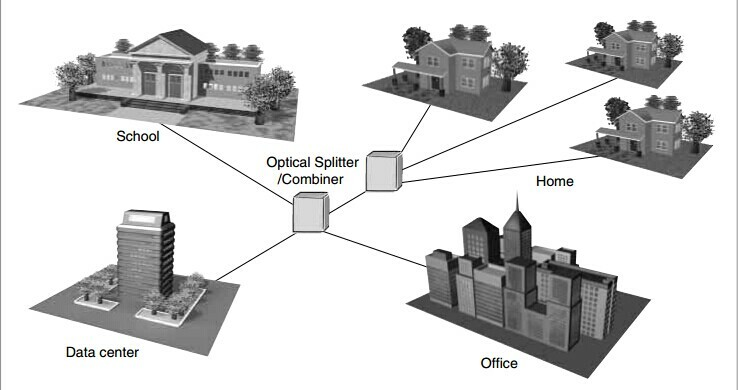 Providers aim to offering fiber-to-the-home (FTTH), (fiber-to-the-building) FTTB and fiber-to-the-curb (FTTC) solutions through advancing passive optical network (PON) technology. The term “PON” may confuse you for its complexity and extensiveness. Details are as followed. PON is a single, shared optical fiber that uses inexpensive optical splitters to divide the single fiber into separate strands. 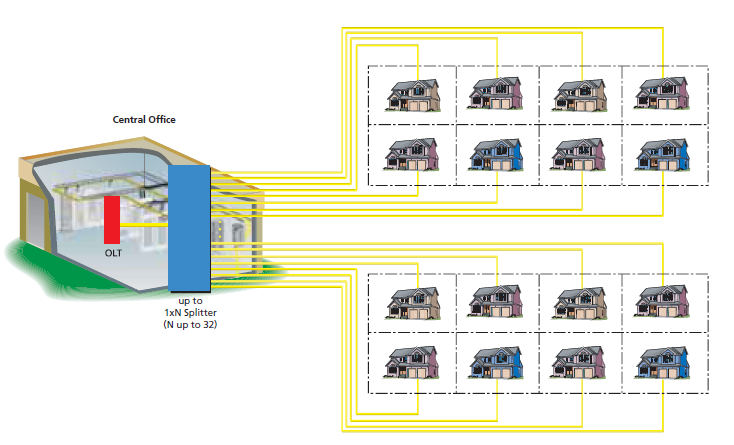 It can build up a point-to-point topology supporting 1Gbps transmission to home and business typically within 20km. PON system is called “passive” because that there are no active electronics within the access network. It uses optical splitters to separate and collect signals rather than electrically powered switching equipment. 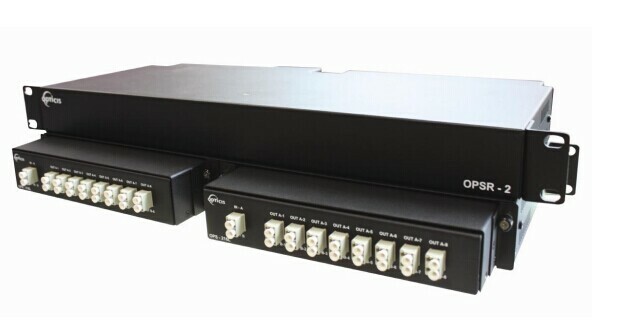 PON consists of an Optical Line Terminal (OLT) connected to multiple Optical Network Units (ONUs) via an Optical Distribution Network (ODN). OLT: it is a device at the service provider’s central office, performing conversion between the electrical signals used by the service provider’s equipment and the fiber optic signals used by the passive optical network and coordinating the multiplexing between the conversion devices on the other end of that network. ODN: it is used for distributing signals to users in a telecommunications network by optical fiber. 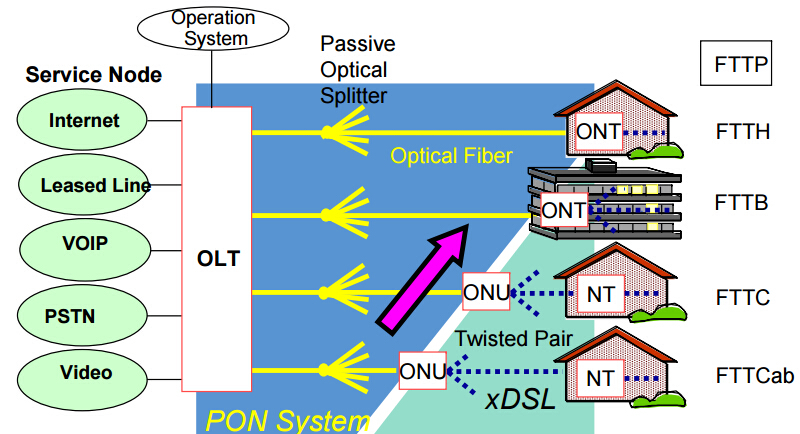 ODN has been made up entirely of passive optical components particularly singlemode optical fibers and optical splitters. ONUs: they are devices near end users, delivering traffic-load information provided by OLTs to each end user. PON system has achieved significant deployment in today’s FTTx networks especially in FTTH networks as the development of Gigabit passive optical network (GPON) and Ethernet passive optical network (EPON). Nowadays, GPON and EPON are the mostly widely used types of PON for their low cost, high bandwidth, great flexibility and easy management, etc. GPON: it is defined by ITU-T recommendation series G.984.1 through G.984.6. It can transport not only Ethernet, but also ATM and TDM (PSTN, ISDN, E1 and E3) traffic. It supports services like carrying video and delivering video on single fiber distribution, allowing low-consuming transmission, more efficient maintenance, cabling and overall performance. EPON: it is defined by the Ethernet standard rather than by the ATM standard, making you utilize the economies-of-scale of Ethernet. It can provide simple and easy-to-manage connectivity to Ethernet-based, IP equipment both at the customer premises and at the central office. It is perfect for voice and video traffic solution as with other Gigabit Ethernet media. For more information about OLTs, Optical Splitters and ONUs, please visit www.fs.com. This entry was posted in PON Systems and tagged EPON, GPON, ODN, OLT, ONU, Optical Splitter, PON on June 27, 2015 by Admin. As the use of mobile applications and services that require increasingly more bandwidth continues to grow, wireless service providers must find cost-effective and efficient methods for meeting the bandwidth demand. Legacy transport networks are no longer capable of adequately serving today’s cell sites. Newer technologies such as GPON, WDM-PON, and Ethernet over CWDM/DWDM are all well-suited to cost-effectively address the growing bandwidth needs of wireless service providers. Regardless of the technology used, Fiberstore product is an integral part of the solution. While GPON has been adopted as a technology of choice in high-speed access networks for inexpensive residential service delivery, more recently, it has begun to spread into business access. With the ability to deliver up to 10Gbps per GPON OLT port, it can also be a cost-effective technology for delivering higher bandwidth to cell towers. 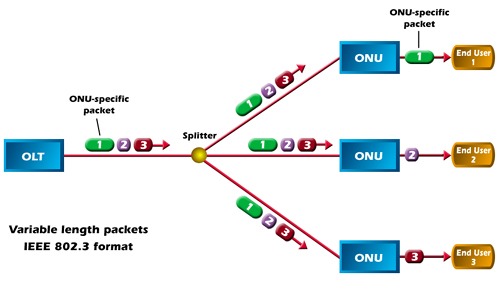 Whether the GPON splitters are collocated with the OLT or distributed in the field, it is likely that a multiple of splitter modules would be needed to handle each serving area. To aid with this, the SplitLight HD can provide up to 16 GPON splitters in a single, 1RU chassis, while traditional solutions can only provide a single GPON splitter in the same footprint. In addition, legacy LGX solutions would require at least 4RU to deliver the same density. Building on the advantages of GPON, shared infrastructure and a single OLT transponder, WDM-PON provides the added advantage of delivering a dedicated wavelength to each GPON ONT. WDM-PON does not use a splitter. Instead, an Arrayed Waveguide Grating (AWG) is used to multiplex and de-multiplex wavelengths between the feeder fibers and distribution fibers. The result is dedicated bandwidth and a more secure network for each subscriber, or in this case, cell tower. Another advantage of WDM-PON is the ability to add/drop wavelengths at intermediate cell towers that lie between mobile switching centers. As with GPON splitters, it is likely that multiple AWGs would be required at both ends of the WDM-PON network. The SplitLight HD can also house up to 12 AWGs in a single, 1RU chassis. In addition, the SplitLight HD has the flexibility to also house passive OADMs for the intermediate add/drops. This entry was posted in PON Systems and tagged GPON, GPON Fiber Access, GPON Network, GPON OLT, GPON ONT on May 22, 2015 by Admin.